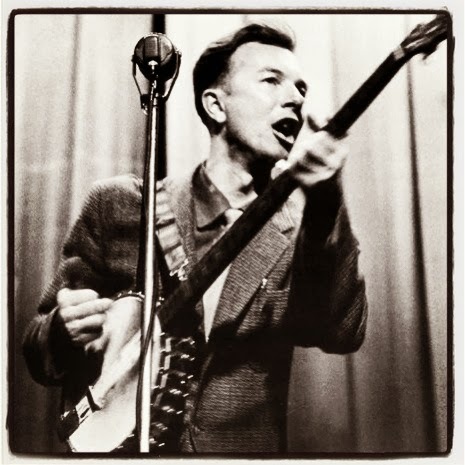 American Wolf: Last Thoughts On Pete Seeger, 1919-2014. Last Thoughts On Pete Seeger, 1919-2014. Pete Seeger has died at the age of 94. He released over 100 albums in his lifetime and literally changed course of American music, all while working to preserve, protect, and celebrate it. 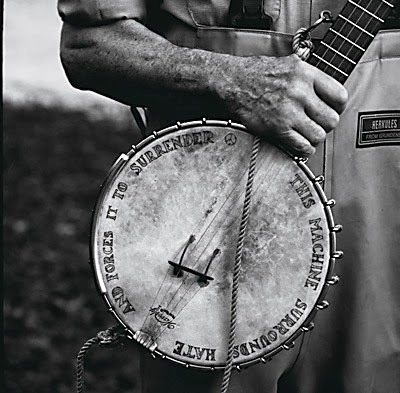 His was a uniquely epic life—classmates with John F. Kennedy at Harvard in the 1930s (Pete would drop out after two years); rambling around with Woody Guthrie in the 1940s (where Guthrie's "This Machine Kills Fascists" sign on his guitar inspired Seeger to put "This Machine Surrounds Hate And Forces It To Surrender" on his banjo); scored huge hits with The Weavers in the 1950s ("Goodnight, Irene" toped the charts for 13 weeks in 1950); served as MC of the Newport Folk Festival when Bob Dylan went electric and allegedly threatened to cut the amplifier cables with an ax in the 1960s (he claims it was because of the muddy sound, not the gesture of Dylan plugging in); made a rare television appearance on The Johnny Cash Show in the 1970s (the two men duetted on the old Carter Family tune "Worried Man Blues"); played a benefit show for Ralph Nader in the 1980s (among countless other environmental and political concerts he gave during this time); received the National Medal Of The Arts from President Bill Clinton in the 1990s (along with a Grammy Lifetime Achievement Award and an induction into the Rock & Roll Hall Of Fame as an "Early Influence"); sang with disciple Bruce Springsteen at President Barack Obama First Inauguration in the 2000s (Seeger and The Boss sang Guthrie's "This Land Is Your Land"), and marched with Occupy Wall Street in the 2010s. He has been called many things over the years—a singer, a songwriter, a hero, a communist, a traitor, a rebel, a pioneer, an activist, a filmmaker, a keeper of the old guard, a living legend, and finally, a national treasure. Pete Seeger is and was all of these things and more—and less—sometimes several at a time. His life plays out like a real-life experiment in American reinvention, Melville's Confidence-Man for the radical 20th Century. How else does one explain the fact that the nation's leading singer of folk music came from the New England elite and attended Harvard? If he spent his life establishing his credibility as a man of the people—which he did, and then some—it would be a remarkable life; the fact he became a musical icon while doing so is a near miracle. He was often less a singer of songs than a leader of them—his own ideals about equality perfected as a stage show. Seeger's wavering tenor was often the match that lit the flame of the audience, and some of his most powerful performances found him leading the crowd in the songs, holding out long, countermelody phrases as the audience sang the melody. He wasn't just performing American music, he was quite literally bringing it to life. For victory brings power and prestige. Beginning by paraphrasing Shakespeare and ending with a wise warning to the future, Seeger had summed up the strife he fought against in four short lines. With such knowledge—through words, through song, through protest—we can surround hate and force it to surrender. Last Thoughts On Phil Everly, 1939-2014.